The Mulia and Asam-asam coal mines operate together. Most of the output from the Mulia mine is used for a domestic coal-fired power station. 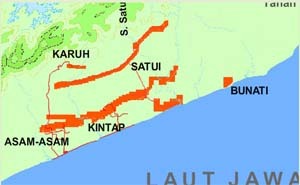 The mine, which is owned by Arutmin, a subsidiary of Bumi Resources, consists of Mulia; west and north Asam-asam, Block C, and the Jumbang coal deposits. On its website the company states that "the extremely low ash and sulphur contents of this sub-bituminous coal make it clean-burning". It also states that the Mulia and Asam-asam mines "production advantages are the low strip ratio, thick coal seams, and access to existing transport and barge facilities at Satui mine. Mulia and Asam-asam coal is crushed but requires no washing." This page was last edited on 23 August 2011, at 04:28.